When the winter comes to an end, or at least we think will come soon to an end, we get in the mood for color. Pastels are always a perfect option to bring a spring mood into your home. Last week when doing my shopping in Antwerp I saw so much pastel tones in all different types of shops that I realized that pastels were really trendy this year. When we think of pastels, sweet romantic tones of light pink and light blue comes to our mind, but not this year, pastels are fresh, hip, and have even a rock touch. All depend in which combinations or style you will use them. The easiest way to refresh your home is by paint. And not necessarily the walls, ever thought of painting some chairs or a chest of drawers? The effect can completely change the look of a room . Pastels for a romantic touch. You can't go wrong with pastels: soft, fresh, sentimental, sweet, and innocent. Pastels tones for the dining room, the table decoration can even be a bit surprising. Try to convince your husband or boyfriend to use those colors in the living room, that will be not easy, probably you will make a better chance when you propose this for the bedroom. Combine romantic pieces with modern items for the bedroom. So how to use pastels in the bedroom without creating a super romantic and feminine room? Pink walls in combination with a more graphical floral wallpaper. Some high-tech elements, metal lamps in combination with a bed that even Marie Antoinette would like to have, will give it a modern vibe. 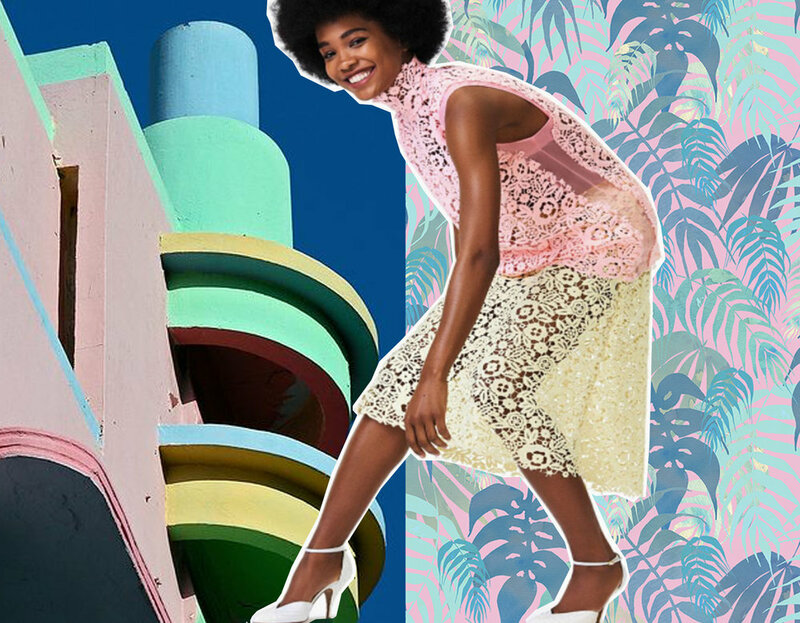 Get inspired by the Art Deco district in Miami and you feel immediately that pastels can get very hip. Use bold print, not the sweet romantic flowers we know from our childhood. Pastels can be fun, all depends on how we use them. Make strong combinations and your pastels will look more modern than you could have imagined. Pastels to comfort us in the bathroom. It is nice to wake up and enter a bathroom in soft colors, it is comforting us. And it doesn't look like the bathroom from the 50's when we combine it with a black tap. Color has entered the bathrooms again in a strong new way. Combine the pastel colored furniture with white ceramics, or go for colored sanitary ware. Even the old-fashioned radiators come in pastel colors these days. Who told you an office should be clean lines, simple colors. Feel more creative and productive in a nice surrounding. Make it playful and feel good in the room, it can only help you to stay in a good mood when stress is knocking at your door. 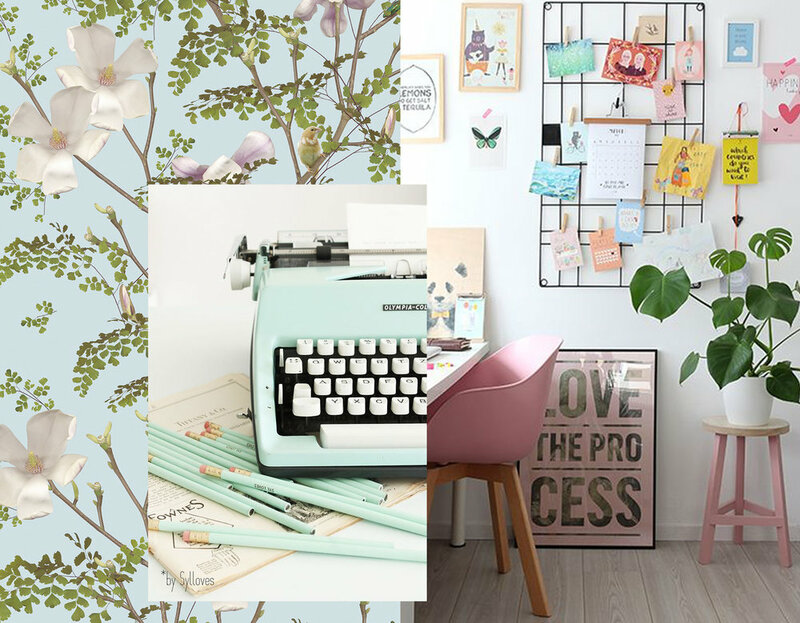 A wallpaper or mural in pastel colors with stylized flowers, posters, post cards, a comfortable armchair and you will feel at home when you are at work. Pastels with a rocker's touch. Once you start using materials which you won't consider immediately for pastels, such as leather, than this color palet gets a complete other dimension. 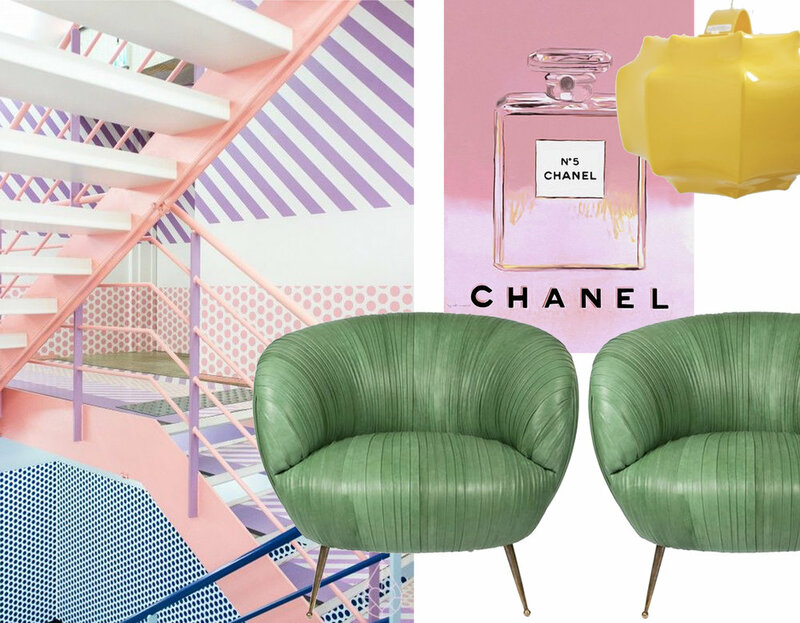 Combine industrial with pastels tones, simple graphical motifs, some pop art inspired posters and everybody will agree that pastels is not just for teenage girls.